I’m not quite sure what got into me. I’ve very commitment-oriented and have long been satisfied with the way things were going. My own transgression continues to surprise me. On a Sunday afternoon, with Richard and the two little ones, I perused the aisles at the local Trader Joe’s. There was debate over whose basket got to hold the pasta, an unwillingness to sample the warm spinach and kale pie, and juice testing … I admit it. I’m stalling. I first saw her selecting tea. I passed. Then glanced back. While I was trying to find the familiar Gruyere and Cheddar melange that I use for mac and cheese, I got a closer look as she perused the goat varieties. After Richard turned the corner, I had to approach. “I can’t keep my eyes off your hair,” I said. But I like my hair, I kept reminding myself every moment the tantalizing thought entered my head. Gina knows my hair. She’s never failed me. But I just kept visiting the idea of the adventure. I couldn’t let it go. Finally, I told Siri what I wanted. I thought, if Siri can’t find it, it’s just as well. I was actually counting on Siri being the incompetent companion she so often is – so she could save me from myself. Recently, I requested that she find the Father Solanus Casey Center. Instead she delivered to me every salon in the tri-county area. Even after several attempts, she couldn’t find for me that lovely place at which I wanted to pray. Apparently, however, salons are Siri’s forte. She found Not My Salon in one try. Drat. I’d like to blame her – but only I can take responsibility for what happened next. Timidly, I clicked that little blue arrow to dial the number. The party on the other end answered, and I did it: I made arrangements to let someone I didn’t even know run their fingers through my hair. What was I doing? I’m risking too much I thought. How would I tell Gina? When the day approached, the doubt continued. As I was close to Not My Salon, I received a call that Not Gina was running late. I don’t have time for late, I thought. I should just cancel. This is a sign. My schedule doesn’t accommodate a trip across town, let alone the trip and another half an hour. I was so close, though. I’d already spent the time. And I saw a cupcake shop on the next block. I disgusted myself at my ability to justify this whole affair. I need a little down time. A few minutes with a cup of coffee and a cupcake will be a nice respite, I thought. I need a respite. Don’t I? The salon was big and busy. Kind of hip but not too pretentious. At least a dozen chairs. About half of the stylists sported coifs that combined made up the majority of the rainbow. Kind of fun. And between asking myself, “What am I doing here?” I thought, as much as I love green, I sure hope Not Gina isn’t that girl over there with the (faded) verde hair. Not Gina approached. She had on the cutest little Kelly green floral corduroy shirt dress, black opaque tights, knee-high black boots. Her hair was long and naturally wavy. She was fresh-faced and freckled: reminding me of a taller version of my sweet Mary Claire. I tried to let my doubts go. I relaxed and stopped nagging myself for doing this. “It’s okay.” I justified again. I need a change. Everyone needs a change now and then. Introductions were bumpy at best. I wasn’t sure if she heard me. I wanted to keep the length in the front for when I wear hats, and I didn’t want my neck shaved. My thoughts went back to Gina, who knew my little quirks. And here I was, starting over with Not Gina. I felt like an awkward teenager. Next thing I knew, I was on my back. I will admit, the shampoo was a little rough but invigorating. Once back in the chair she studied me. Slowly combing through my locks. “You have a lot of cowlicks,” she said. I inhaled the “yes, I know” to calm the momentary “what-am-I-doing-here?” shot of stomach juice with an “I-can-still-leave” chaser. I asked her how long she had worked there. Ok. I thought. She’s experienced. That’s good. Then in conversation, she used some choice words describing what she could do for me. Appealing words like modern, swinging, and, yes, even hot. And then she used that one word that fuzzy-headed girls like me only dream about: easy. Once she got to work, she seemed pretty systematic. Next thing I knew, scissors were down, and she started drying my hair. That was painless. I thought. And from what I could see, it looked pretty good. But then she picked up a straighter. Outside of a hair dryer, I don’t use appliances. Without discussion, she set to work. Not Gina assured me, it was just to check out the cut. Examine my cowlicks. Make sure things were straight. It seemed to go on forever. At some point, she angled the section of hair I mentioned I didn’t want cut, and I stopped her just short of cropping the front of my hair right off. “You don’t want bangs?” I thought we covered that. No bangs. The nervousness came back, but she seemed relaxed while “why am I here?” continued playing on repeat in my head. 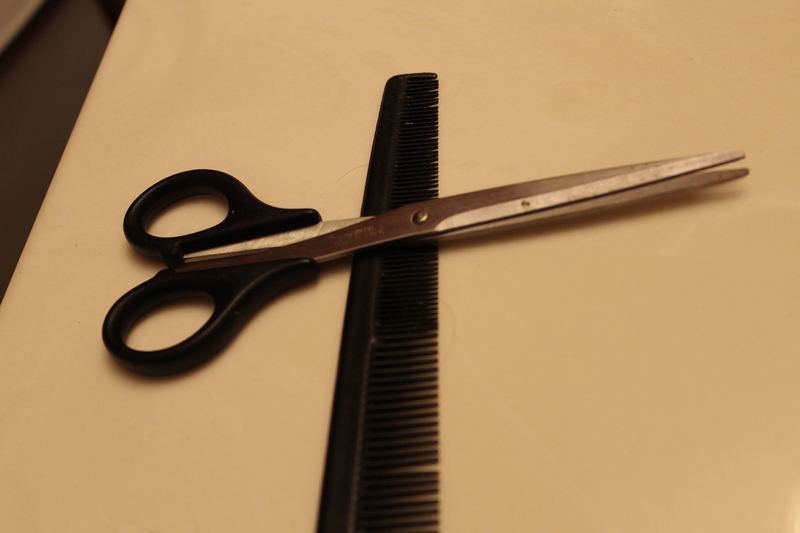 Suddenly – with scissors a-blazing – she was chatty. “Oh, I write poems,” Not Gina said. “Hundreds of them really.” I nodded with my eyes not moving for fear of the scissors. Wait. What am I doing here? In the next 15 minutes, I learned about the apparent joys of sitting in an empty room with your own energy (which is not the same if there is a picture hanging on a wall), primitive painting using food coloring and frosting, an unfulfilled life due to the squashed ambition to become a dancer (without lessons), and a yearning desire to be a vegetarian – if only she could only stop craving meat. At one point, she said something that led me to interject information about me singing at church. She said she was going to go see a jazz band at a church down the road. She asked me about church and what denomination I was. She told me she was baptized Catholic, then scoffed that her parents weren’t at all religious. She didn’t know the denomination of the jazz-band church. At that moment, I knew why I was there. Her sincere eyes – pale and green like my own – locked into my gaze. Searching. I shared with her the fact that with the Sacrament of Baptism she received an indelible mark on her soul . “It’s always there,” I quietly told her. Again her hand went to her chest, brushing her hair just enough for me to spy a cross among other charms around her neck. “Maybe I should make my Confirmation,” she said. I told her that deciding to follow Christ meant making a commitment to pray and to learn about what His church teaches. Maybe she should learn about that Baptismal promise her parents made on her behalf. After she shaved my neck (sigh), we said our goodbyes. I could see her contemplating our talk. I left her armed with some information to help her on her journey, and I promised I would pray for her. She sweetly and humbly thanked me. At that moment, my hair looked great, but when upon leaving, when the receptionist asked me if I wanted to make my next appointment or wait to see how it grew out – she confirmed what I suspected – it wasn’t going to last. It’s only been a handful of days, but every time I look in the mirror and try to tuck my too-short piece of hair behind my ears, I can’t help but recall the whole affair. Just the same, I am always grateful for the opportunity to share with others my faith, and through these experiences I am gently reminded that it is not without sacrifice that we are called to follow and spread Christ’s love. Go, therefore, and make disciples of all nations, baptizing them in the name of the Father, and of the Son, and of the holy Spirit. The last of the season as frost threatens all those lovely buds. 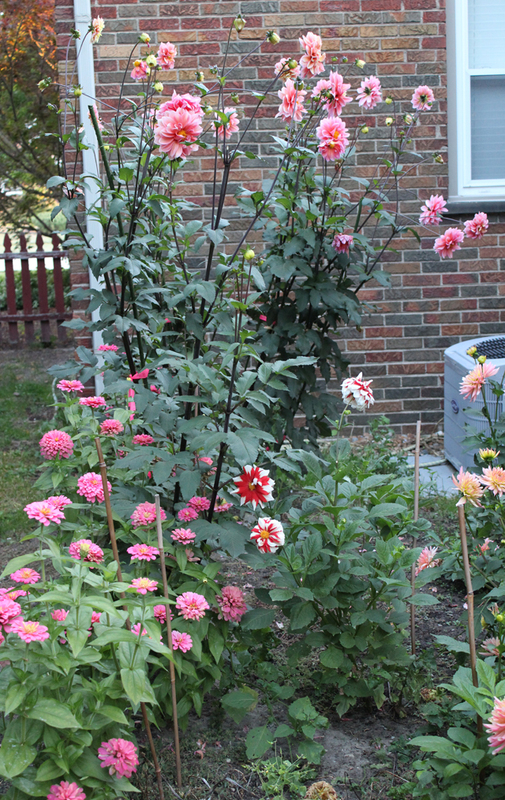 So out went the veggies (eating fresh is overrated anyway), and in went some little bare root tubers – Chocolate and Candy; Firebird, and Tequila Sunrise Dahlias; a few perennials in the form of Regale Album Trumpet Lilies, and Edulis Superba and Bouchela Peony. It looks great from inside, too. He also planted some Pink Magellan Zinnia that we got down at Eastern Market just to get things going, since starting from those naked little roots was going to take a while. We didn’t actually plan to plant this one, but she crashed the party anyway. We didn’t see the lilies or the peonies flower at all, but they’re just getting ready for next year. 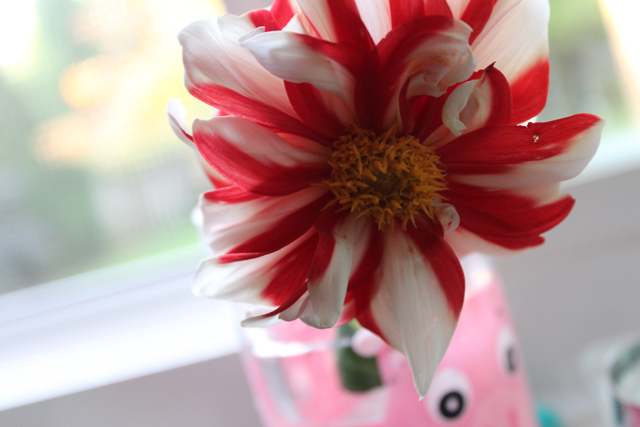 The dahlias took some time to get going, but once they did: Pow! Soon enough, we’ll dig them and store them for planting next year. 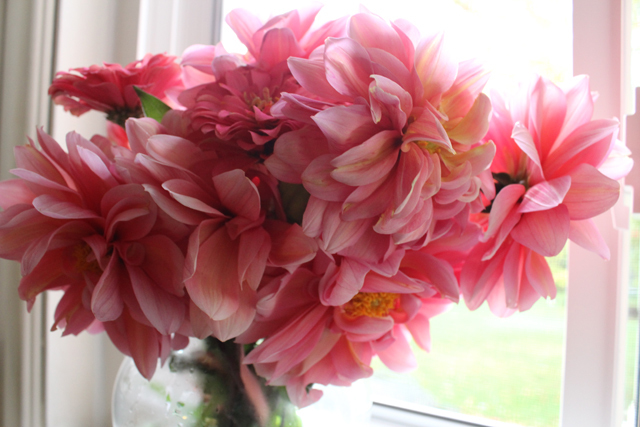 So … how about a dahlia as big as your head? This flower would almost be the size of Cliff’s head – if he didn’t have such a GIANT noggin. As frost threatens those sweet unopened buds, I feel like cursing the weather – even though I love the changing seasons. 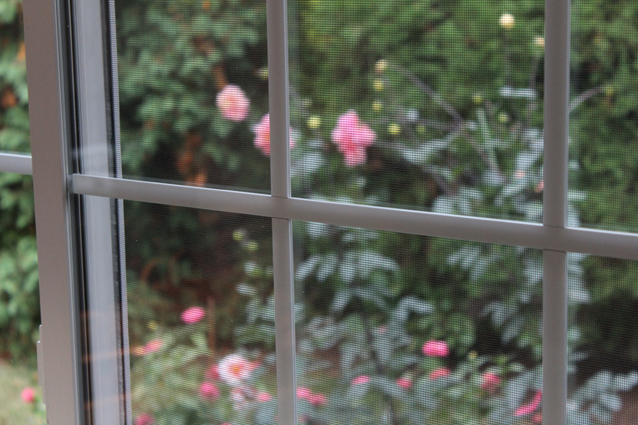 The flowers, the experiment of the garden, and the thought behind it all has provided so much simple joy since May. 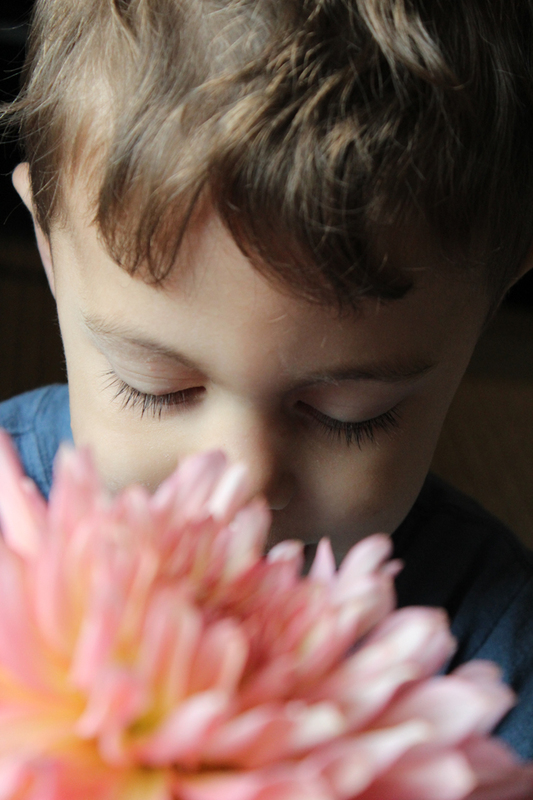 The children have loved the flowers – much more than they did the veggies. We can’t help but be mesmerized by their beauty and be grateful and amazed that things that look like that actually grow right out of God’s earth. Even new-fangled technology can’t work without cooperation from the user. Our fifteen-year-old is a go-getter. Mighty, indeed. These past few weeks we’ve had trouble waking her in the mornings. Usually she’s up before the rest of us and already reminding us of her (and thus our) morning plans. Today, we decided to get to the root of it. Why wasn’t she waking? Was she depressed? She did after all just break her foot, calling off the remainder of her beloved swim season. Was she going to bed too late? No way. She’s a carpe sleepem, carpe diem kind of kid. Was there something wrong with her alarm? She informed us that she set the alarm on her phone and on her clock, but she still wasn’t getting up. Something was wrong with both of them. She set two alarms, and both were failing? Why? Did she not hear them? Yes, she heard them. But she set them both an HOUR before she needed to get up to fulfill some fantasy that she MAY choose to get up that early sometimes, but not all the time. But of course, she actually chooses to get up that early none of the time. So she turns off her clock and then turns off her phone and, oddly (cough) falls back asleep. We tried to explain that the purpose of an alarm is to get you up and going. Not to wake you so you can decide if you’re going to get going or not. Because chances are on a chilly fall morning without anything really pressing, you’re not. It wasn’t the system failing her. It was lack of commitment to the system. Click on it to go to the site. My dearest and I – with another couple – are part of a leadership team for a big stewardship campaign at church. 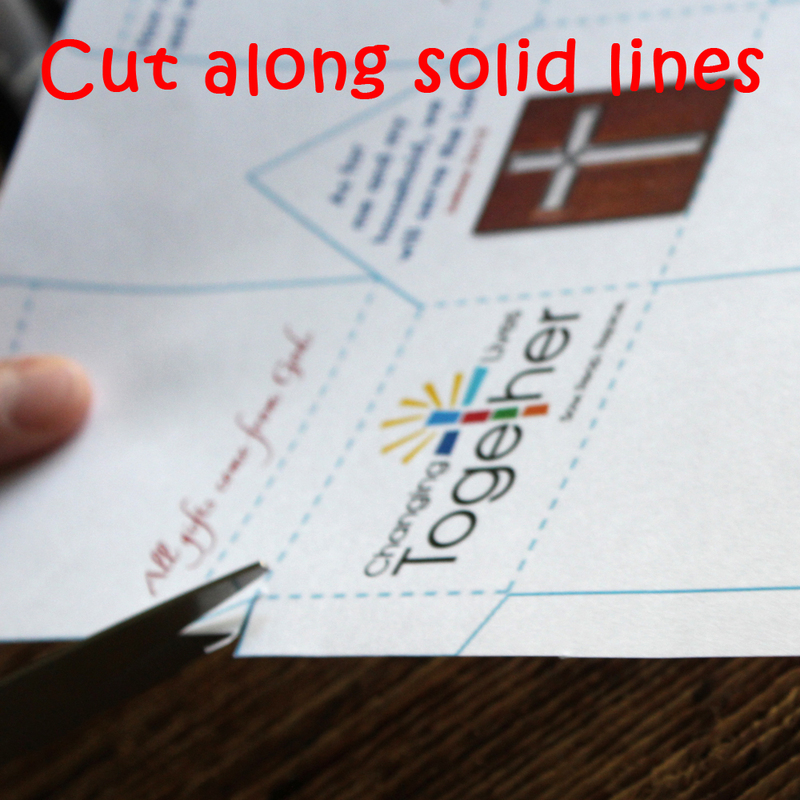 It’s a diocesan-wide thing, and we’re coming up with … (wait for it) … the children’s activities. The deal about this campaign is that all the planning and education has to happen in a pretty condensed period of time. So we’ve had to bust-a-move. I’m excited. (Okay. I’m excited about everything.) The program is coming together, we’ve gathered some great folks willing to share their time and talents with the parish. Yesterday, we delivered our first piece of the program for kids in the religious education program and those enrolled in our parish school: That’s more than 900 children. We decided that the theme verse for our activities is “As for me and my household, we will serve the Lord.” Joshua 24:15. With that as the focus, we have come up with a few very tangible ways to help students learn about stewardship. 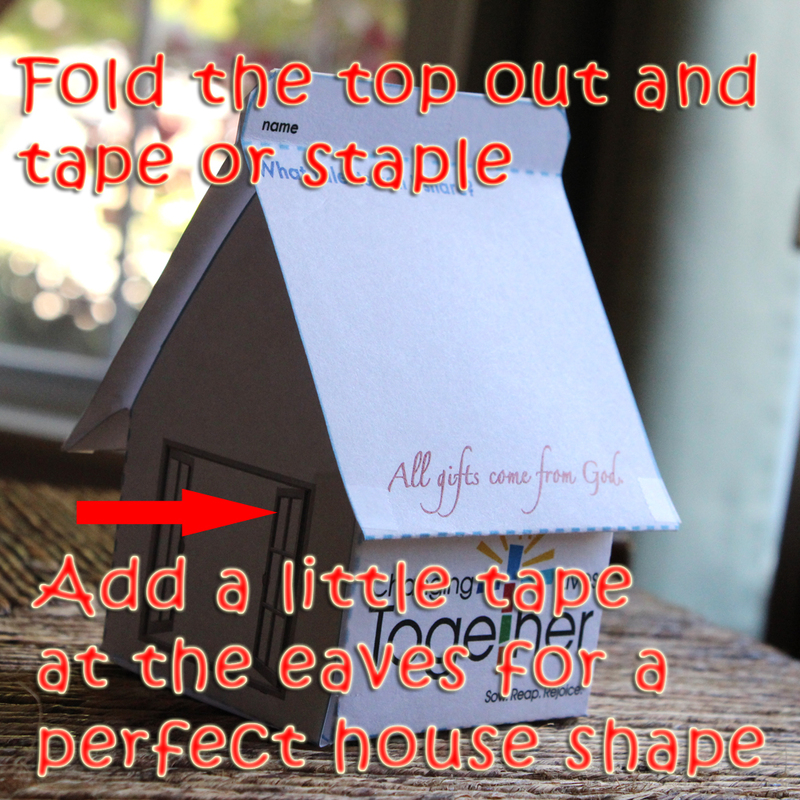 The activity we introduced yesterday was for every child to build a little paper house. 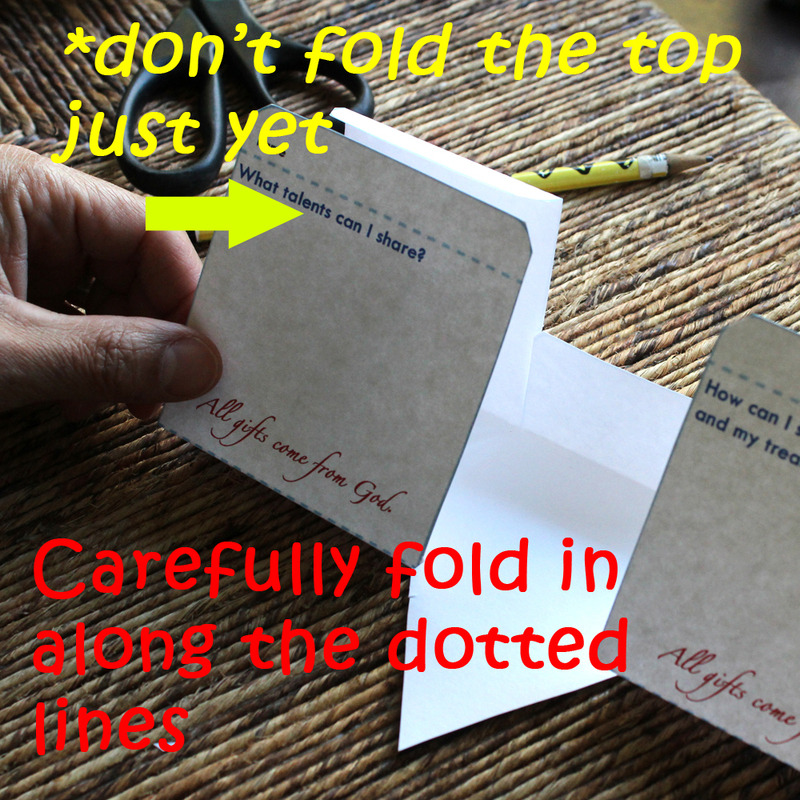 There was a short lesson plan – introducing them to the theme verse, the theme song (A rousing version of Rorey Cooney’s “We Will Serve the Lord”) and the idea that all our gifts come from God. There was also a little room for discussion. Since time in the Religious Education program is at a premium, we designed the activity to be doable in 15-20 minutes. 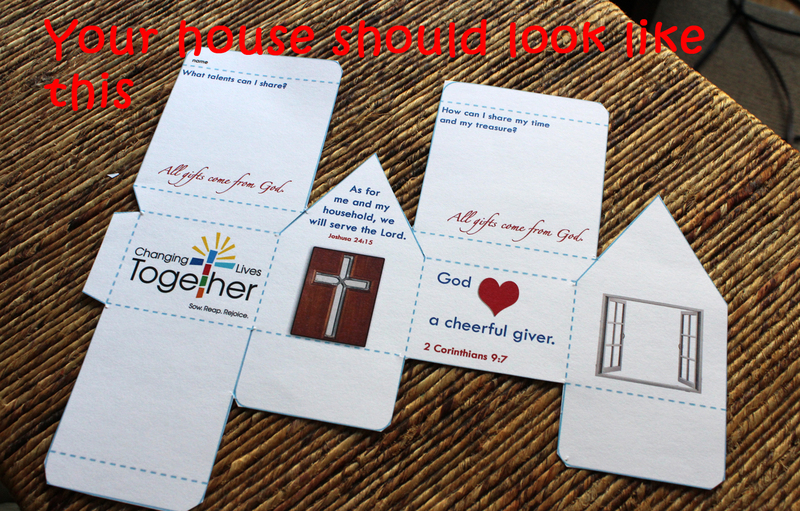 I found a great house template at the most charming blog site: Just Something I Made. (One of my new favorites for creative ideas. Nice photography, too.) 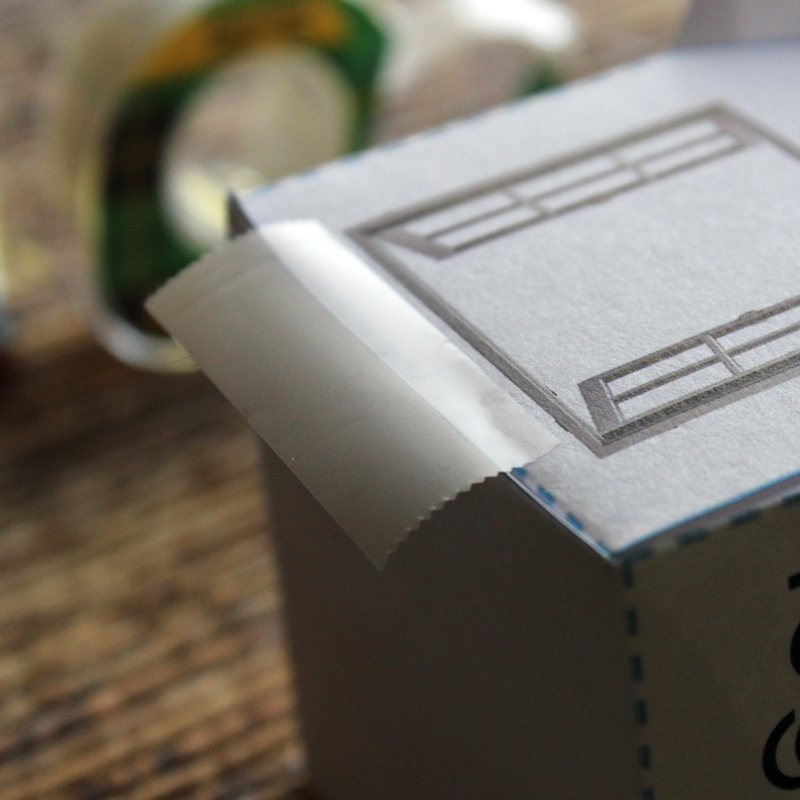 We needed something that was one piece, easy to follow, didn’t involve glue and was cute. (Okay, I needed the cute.) And after combing through what seemed like a mountain of examples, this template really fit the bill. I added graphics and some text, and we decided to print it on 11 x 17, 67 lb. cover stock. That made the finished house about the size of a pint Chinese takeout box and offered a little more durability since the children will be using these houses for activities the next five weeks. 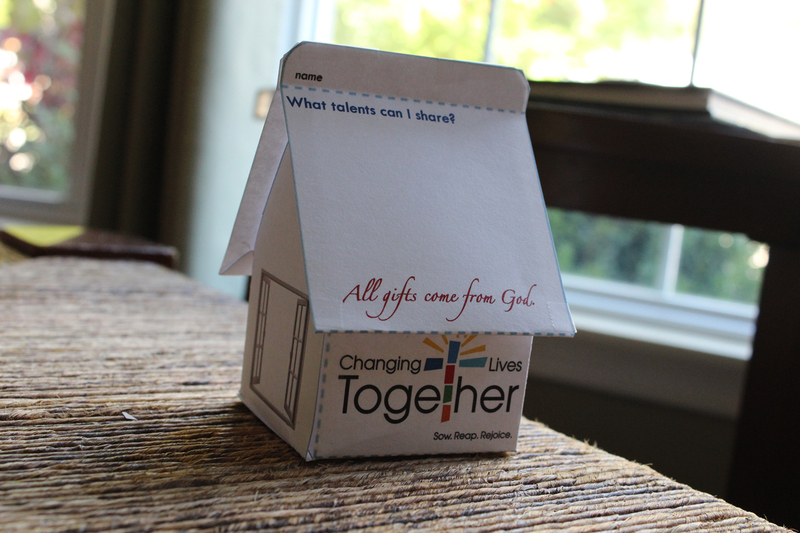 The only decorating for the students was that they “cover” the house with their gifts and talents. 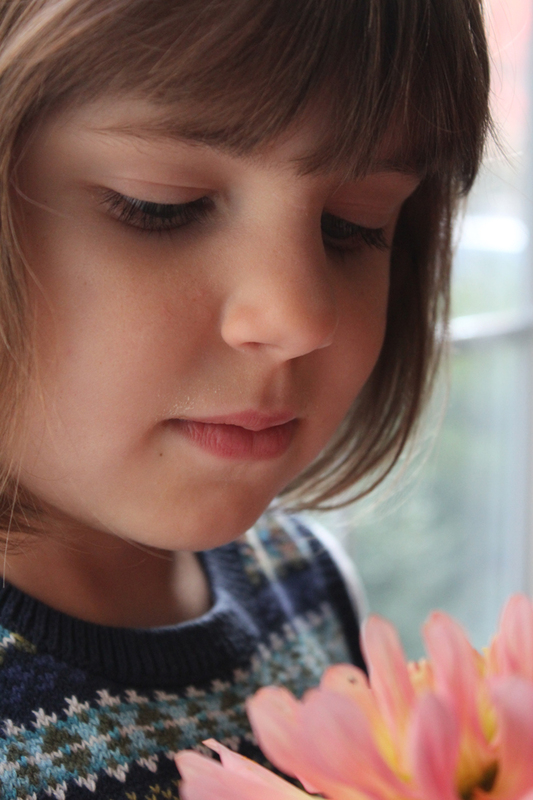 For little ones, it could be drawing pictures, for older children, they could write them out. We made accommodations to the fact that the littles might not be able to actually cut out the houses. (Remember, time is limited.) They instead just drew on them while they were still one uncut piece, and students earning service-hour credits cut out the templates and assembled the houses for them. I’m sure they’ll be excited when next week they see their work put together as a house. We will continue to use the houses throughout the program – I’ll fill you in more on that later. There were a few more photos – just for ease. But you get the picture. It all seemed to go well. 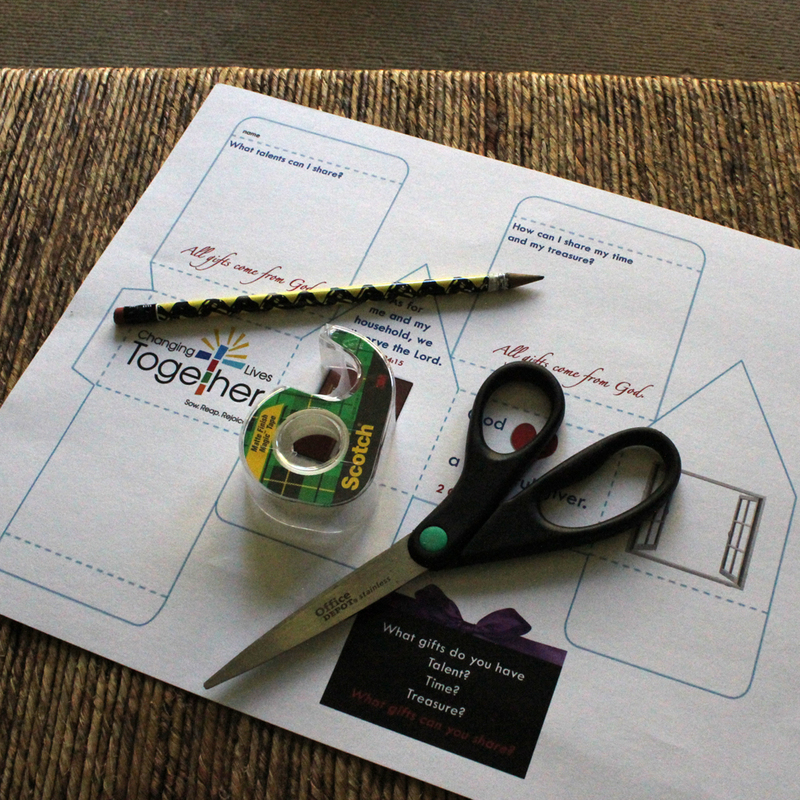 We used a portion of the paper to add a bookmark highlighting the family event that will be the culmination and celebration of all of these activities – it also gave the children something to take home related to the activity. Stay tuned for more. Next week, the houses go with the students to mass for a special blessing. 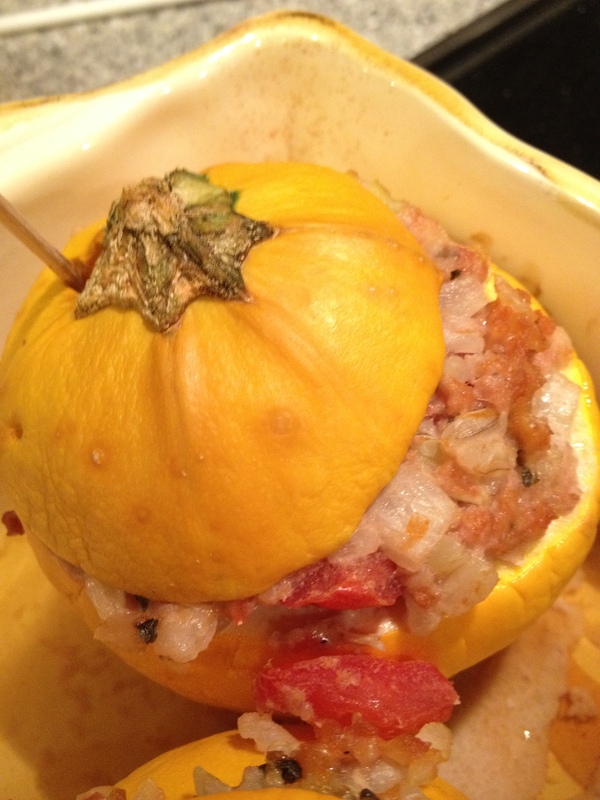 Late this summer, I became obsessed with these magical little zucchini called “eight ball” squash. The price was right during our Saturday Eastern Market trips so I picked them up frequently. I sliced and grilled them or I halved and sliced to sauté with a little butter and olive oil. Then I decided it would be fun to stuff them. I carefully scooped the insides, trying to leave a uniform but thin wall. 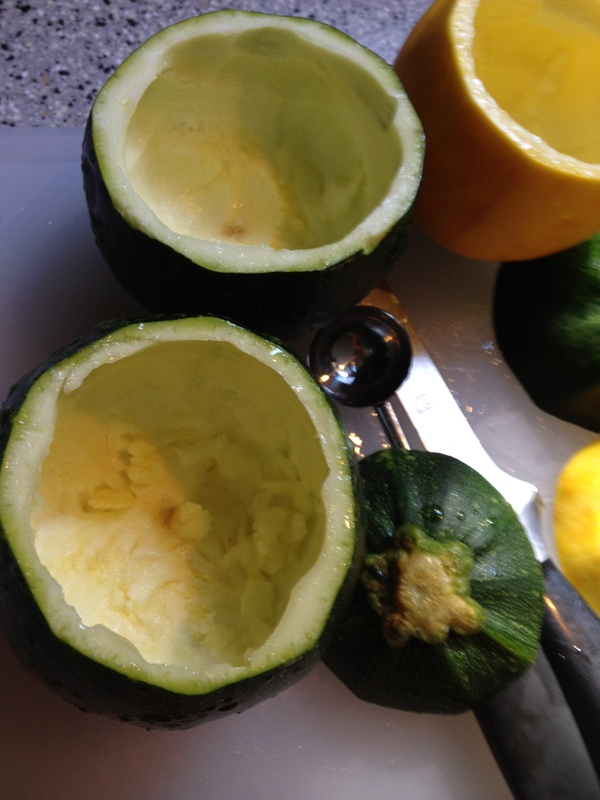 The outer peel on these squash seems a little tougher than traditional zucchini. I used a melon ball spoon to get close but keep control. I set aside some of the inside for the stuffing, but it was much more than I needed. I mixed the left over little zucchini balls with other fresh veggies for a side during another meal. I stuffed them with a ground turkey mix. In olive oil, I sautéed two garlic cloves, a half of sweet onion, red pepper in a pan, and then combined it with some of the zucchini insides and 1.25 lbs. of ground turkey. I added some (not enough) chopped fresh basil, 1/2 cup of Parmesan, sea salt and fresh pepper. (I use the 85/15 fat turkey. I’m not a fan of the lowest fat ground turkey.) I covered and baked at 350 for about 45 minutes, and then uncovered until the turkey reached 165 and the skins looked slightly browned. In the future, I’d brown the turkey a bit beforehand and rub the outsides of the zucchini with oil so it looked less dry. They were very tasty and really looked great. Plus they were well-received by the kids. I look forward to some new stuffing adventures next summer – maybe Quinoa with Gruyère cheese and wild mushrooms and roasted peppers. Something a little more exciting.